...that Dredgen Yor, the original owner of Thorn, was a famed Guardian who fell to the Darkness? ...that Oryx used a portal formed by the Techeuns after the destruction of the Awoken fleet to infiltrate and invade the Dreaming City? ...that while Skorri died in Rise of Iron's prologue, in The Taken King she was said to have been the only survivor of the Iron Lords? "The Red Legion took the City. So Lord Shaxx took some of their capital ships. Now, they serve as a live-fire training ground for the Light. Even without a Tower to support it, the Crucible thrives." Retribution is a Crucible map located in the Upper Stratosphere of Mars. Sometime after the Last City's fall, Shaxx and his Redjacks hijacked several Cabal carrier ships and converted them into training zones. Retribution's design, at first glance, seems to be based on the Vertigo map, meaning long-range weapons such as sniper rifles would be useful. Similar to Javelin-4,It is comprised of a few open courtyards, corridors and circular areas. Up until the release of Forsaken, Retribution together with Wormhaven was the only PlayStation exclusive Crucible Maps in Destiny 2. 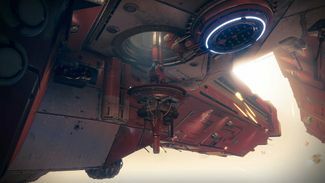 The ship that the map is based on can be seen firing at the Martian surface below. A view of the warship's underside.